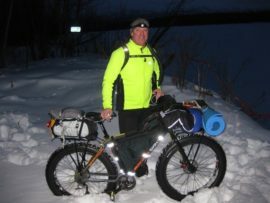 David Hill participated in a 100-mile bike race held on the Iditarod Trail in Alaska on Valentine’s Day. His adventure did not turn out the way David planned. Come hear David’s story presented through photographs, Wednesday, April 17 at 6:30 p.m. in Taylor Community’s Woodside Building. This free event is open to the public.